Fun Things from C&T Publishing! Create. Grow. Connect. 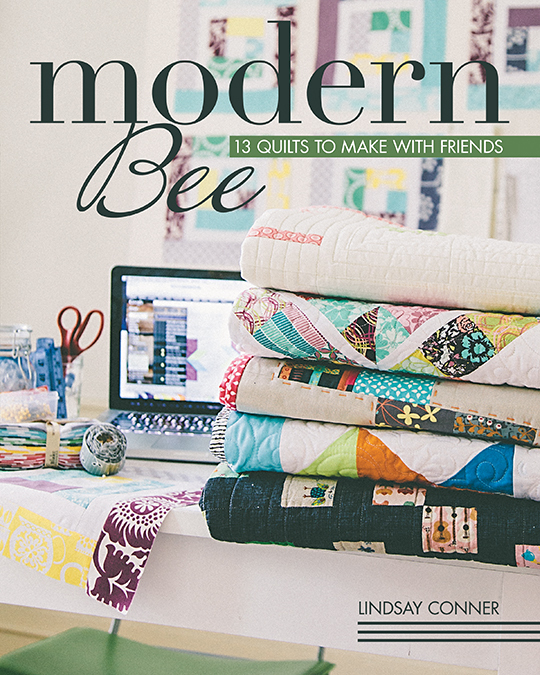 This how-to book features 13 projects for a virtual one-year quilting bee. Crafted with a modern aesthetic, the patterns are inspired by traditional quilt blocks as well as bits and pieces of daily life. As you quilt along with this book from month to month, you’ll master sewing techniques of increasing difficulty—from easy to advanced. Each project includes instructions for assembling the block and for finishing a full-size quilt. You’ll also find a comprehensive section on quilting basics and plenty of tips on organizing your own virtual bee. What’s in the book? Enjoy a video preview of Modern Bee on YouTube! Every year my quilt group selects a quilt design for our raffle quilt. It’s always a difficult selection process. And then the fun begins when we come together to sew it all together. We haven learned that we each sew a tad differently, and so it isn’t as easy as it seems to put together even the simplest of quilts. Funny, because we are all good sewers. But that’s the way it goes when you are working in a group. So perhaps this book will shed some light on sewing together! 2015 Blackberry Jam Quilt Show Winners!